Sometimes a game’s title tells you everything you need to know. Shovel Knight, Battletoads, and even Super Mario Odyssey all give you a pretty good idea of what you’re in for before you boot up the game. That isn’t the case with Disco Elysium, and I had no idea what to expect when I arrived for my appointment at PAX last week. But what I found was one of the deepest, most intriguing computer RPGs I’ve seen in a long time, and something I can’t wait to play again. Let’s start with that title. 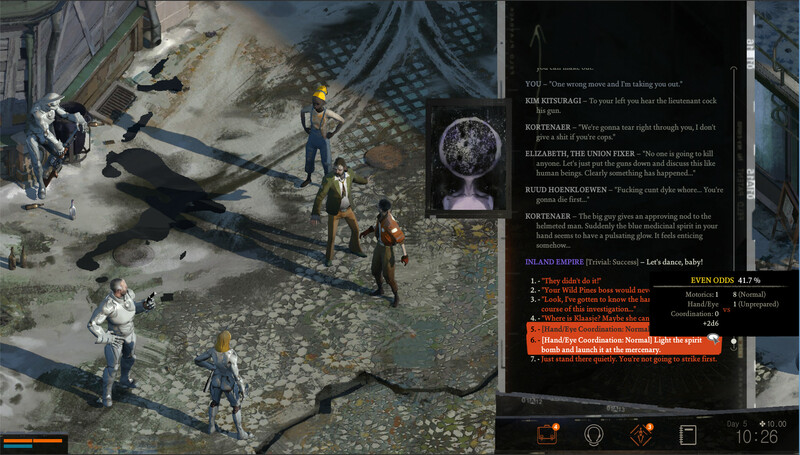 Disco Elysium does contain some music from the 1970’s, but the Disco part of the title has more to do with discovery than afros, leisure suits, and bell bottoms. The world of Elysium is the game’s setting, and the developers told me they intend to create more games in this space. 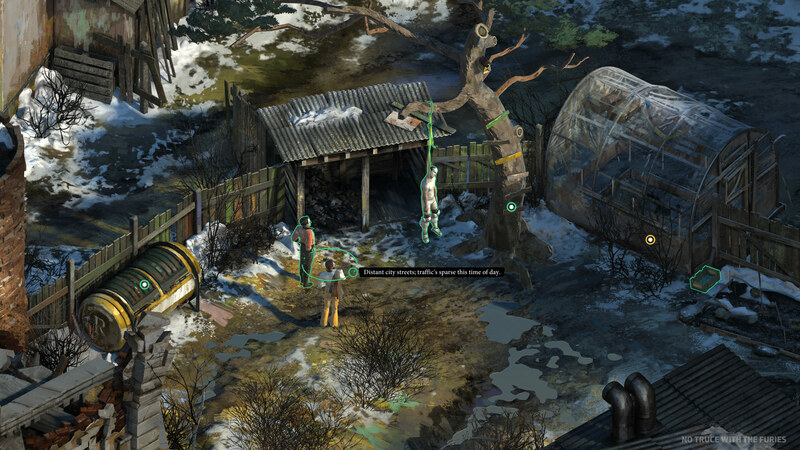 Disco Elysium is meant to be an introduction to this universe. As for the game itself, it’s heavily inspired by late ’90s computer RPGs like Baldur’s Gate. 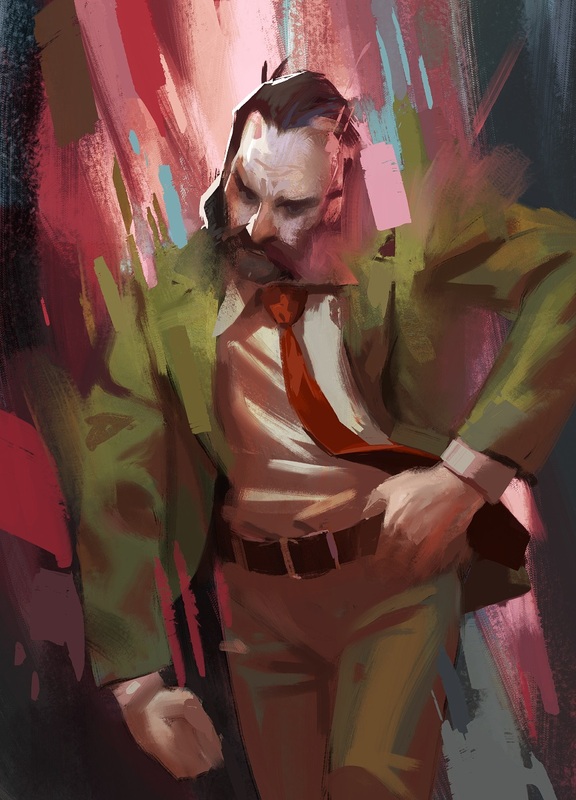 One of the developers told me his mind was blown when he saw a Friedrich Nietzsche quote during that game’s introduction, and Disco Elysium borrows this idea. It’s not exactly isometric like those older CRPGs, but the perspective is similar, and that’s quite intentional. I got a strong feel of tabletop mechanics while playing as well, but we’ll get into that a little later. The developers told me they wanted to allow more meaningful interactions with the world than just shooting everything in sight, and in my opinion they succeeded admirably. 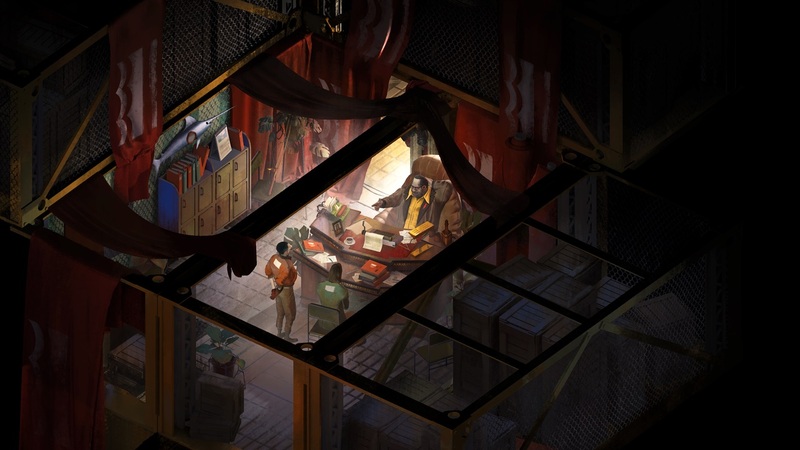 The art style is something completely unlike any game I’ve ever played before, giving Disco Elysium a unique look that should help it stand out from the crowd. 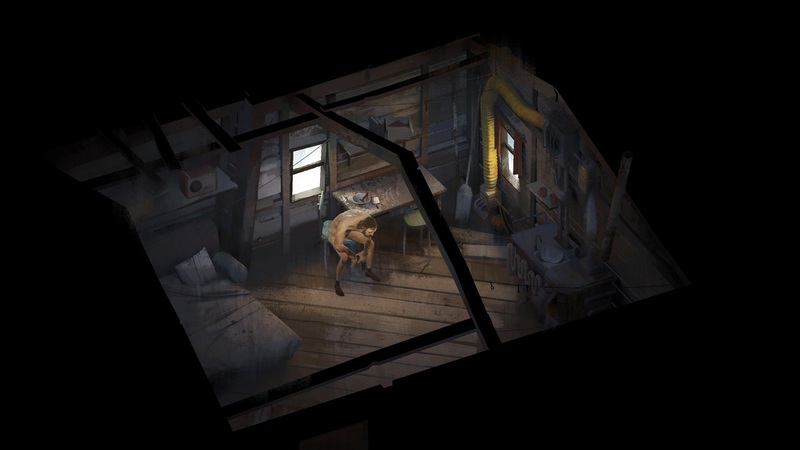 The developer I spoke with mentioned that some of the game’s artists are oil painters, trained at Russian academies. The color palette is subdued in some areas and shockingly vibrant in others, using colors you wouldn’t expect to add emphasis or suggest a character’s state of mind. When the game starts, you begin by reading an internal dialogue between your rational and animal impulses. It seems that sometime last night you consumed a truly heroic amount of alcohol in a successful attempt to kill some brain cells and forget… something. Ethanol isn’t exactly a precision instrument however, and the player soon realizes that the character has gotten so blotto he doesn’t even remember his own name. After dressing, you can leave your hotel room and explore a little more. If you choose to talk to the woman standing just outside, you can try to talk normally, or might have the idea to try and seduce her. I tried this and failed miserably, and she laughed and let me know this was going to be difficult for me later when I had to question her about the murder. This is when you learn that your character is a police officer, sent to investigate a body that was lynched about a week ago. The writing in the demo I played was excellent. There’s a certain dark humor infusing every interaction, and when I tried some of the sillier options I was not disappointed. At one point your character notices some spilled rum soaking into the carpet and the options are: Ignore it (requires a willpower check), Lick it from the carpet (no check required), or Lick it, but only a little (lesser willpower check). The main character gains quests based on his internal monologue, things like “Find and smoke an entire carton of cigarettes.” when he notices another character lighting up. You’ll eventually meet your partner and investigate the body, which has been hanging for more than a week and is quite ripe at this point. A couple of kids standing nearby can be interrogated, but prefer to continue throwing rocks at the corpse and jeer mercilessly when you toss your cookies at the smell. Your character may try to steal the deceased man’s boots, or might find that he threw his police notebook in the garbage during his drunken stupor. There’s a deep system of interrelated mechanics associated with every skill check in the game, from dialogue challenges to physical feats. Your stats play into these, and you earn skill points by exploring and talking to people. There are many places to spend your stat points, and the three main trees that define your character are Intellect, Psyche, and “Fysique,” your strength and endurance. Your character may have poor impulse control based on the stats you choose, and one of the games’ unique features is a certain amount of punishment for overspecialization. If your Adrenaline stat is too high for example, you may not be able to keep yourself from hauling off and punching someone during a tense negotiation. If your Intellect is too high, you may awkwardly blurt out useless information and preemptively lower people’s opinions of you before you realize it. Skill checks take these stats into account, and also add or subtract modifiers based on actions you’ve taken before making the attempt. Trying to persuade someone to let you in the back room of their shop will be a little harder if you’ve dismissed their child-rearing capabilities in an earlier conversation. On the other hand, you can try to break the door down, and might get a bonus if you brought along a crowbar. Each check lets you know your chances for success before you make the attempt, so you can back out to try and tweak your odds if you need to. When you commit, the game rolls 2D6 and adds your modifiers against the required skill threshold. It’s a lot like playing D&D, and failures can be just as entertaining as successes. There’s a lot of thought and game mechanics given to psychology, and the main character has what’s called a “thought cabinet,” a separate inventory for non-tangible thoughts and ideas. You can equip some of these ideas, and holding on to one for a while can cause it to evolve into a belief, which can give your character extra dialogue options or may cause status effects. 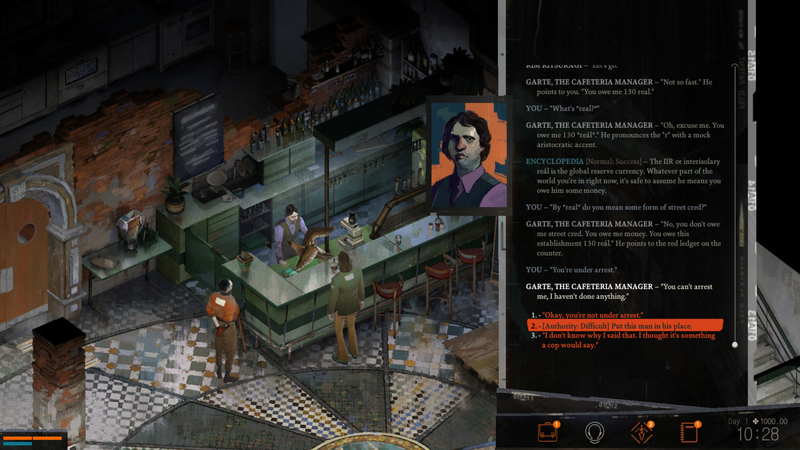 Playing a different build in Disco Elysium will provide an entirely different gameplay experience, and the programmer told me they’re basically writing three completely different games based on how the character is developed. A full run through the game should take somewhere around 20-25 hours to complete. No release date has been announced yet, and no systems other than PC have been confirmed. Disco Elysium was one of the standouts for me during a PAX that was loaded with great games. If you have any interest in a deep, mature game full of dark humor, put this one at the top of your list.